AddressThe address for this sale in Nokomis, FL 34275 will no longer be shown since it has already ended. Shipping available from a local professional shipping company. Local pick-up available. Payments include cash or credit card. 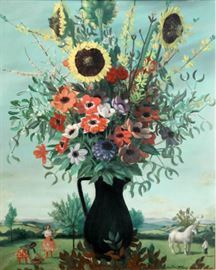 Jean-Pierre Alaux (French b.1925) Oil on Canvas Surreal Floral Description: Artist signed lower right: Jean Pierre Alaux. Unframed. Shipping weight: 3 3/4 lbs. Size: 31 3/4 x 25 1/2 inches. 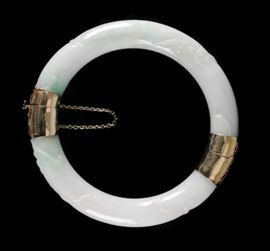 Description: Chinese sea green and russet jadeite bangle. Condition: Excellent Size: Diameter: 3 1/8 inches. Weight: 5 ounces. Condition Report: Excellent Notes: 5 ounces. Description: Hinged yellow gold mounted marked 585. 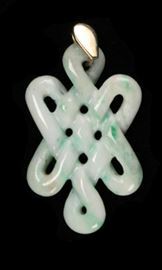 White and scattered green Jadeite. Weight: 4 ounces. Low Estimate: 600 High Estimate: 800 Condition: Excellent Size: Diameter: 3 inches. Weight: 4 ounces. Dimensions: 1 3/4 inches. Condition Report: Excellent Notes: 4 ounces. 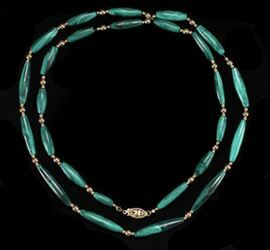 Description: Malachite and 14K yellow gold bead necklace. Length: 28 inches. Weight: 1.09 ounces troy. Dimensions: 9 inches. 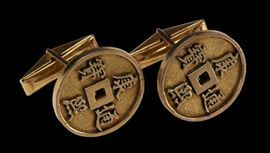 Description: Pair of 14k yellow gold cufflinks with spinach jade cabochon and matching tie clasp. All marked 14K. 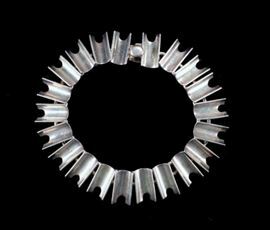 Tie clasp length: 1 1/8 inches. Cufflinks: 5/8 x 1/4 inches. Actual weight: .52 ounces troy. Dimensions: 6 3/4 inches. Description: Clip earrings with pearls with 14k yellow gold mounts marked 14k. Dimensions: 8 3/4 inches. 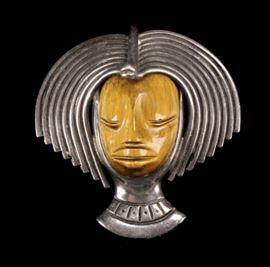 Description: Sterling brooch pendant with inset carved tigers eye face. on the reverse: Sterling 925, Los Ballesteros monogram. Shipping weight; 2 ounces. 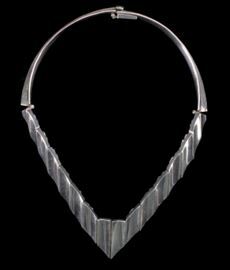 Metal Type: Sterling Silver Dimensions: 7 7/8 inches. Description- Marked on the reverse clasp: Mexico Sterling. Shipping weight: 2 ounces. Condition: Good. Description: Yellow gold 14k mounted bone faux ivory tusk type pins with incised decorations. Not marked but test 14k. Shipping weight: 1 ounce. Description: Unmarked silver squash blossom comprised of 10 turquoise inset tin cones and a horseshoe form turquoise inset naja. Length: 24 3/4 inches. Weight: 7 ounces. Dimensions: Overall: 13 inches. Notes: 7 ounces. Description: Marked on the back: W.M. Sterling. 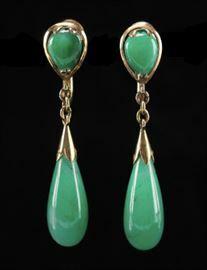 Comprised of 9 turquoise inset stone on a recessed ground and tooled cuff surface. Shipping weight: 2 ounces. Size: Width: 2 3/4 inches. Dimensions: 9 3/4 inches. Description: Marked on base: Clarice Cliff, Newport Potteries with molded number 29A, Condition: Good. Height: 10 1/4 inches. Weight: 1 3/4 lbs. Low Estimate: 100 High Estimate: 150 Notes: 1 3/4 lbs. Description: Marked on the base: Royal Doulton impressed logo, Made In England, X8714, 15414. Low Estimate: 150 High Estimate: 200 Condition: Excellent Height: 9 inches. Weight: 2 lbs. Condition Report: Excellent Notes: 2 lbs. Thai 19th C. Silver Betel Nut Box Description: Low Estimate: 300 High Estimate: 500 Condition: Very Good Height: 3 3/4 inches Weight: 9 ounces. Circa: 1900 Dimensions: 9 3/8 inches. Condition Report: Very Good Notes: 9 ounces. Grimware Byzanta Ceramic Vase Description: Spiderweb luster pattern. 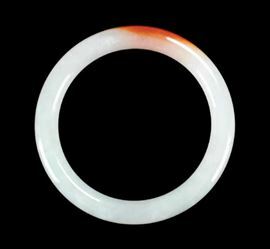 Low Estimate: 150 High Estimate: 200 Condition: Good but wih water ring mark to interior. Height: 6 3/4 inches. Weight: 3/4 lbs. Circa: 1920 Condition Report: Good Notes: 3/4 lbs. Lalique France Crystal Table Frame Description: Etch marked twice on the front: Lalique France. Width: 7 3/8 inches. Height: 8 3/4 inches. Weight: 5 1/2 lbs. Notes: 5 1/2 lbs. Four Continental Crystal Cordial Glasses Description: Lot comprised of four crystal cordials with circular bowl on a thick stem with double series opaque twists on a conical foot. Condition: Very Good Height: 6 3/4 inches. Weight: 4 lbs. Condition Report: Very Good Notes: 4 lbs. Four Continental Crystal Wine Glasses Description: Lot consists of four matching stemmed wine glasses with trumpet bowl on tear drop bubble in the tappered stem on a conical circular base. Height: 7 7/8 inches. Weight: 4 lbs. Material: Crystal. Condition: Good. Dimensions: 62 1/2 inches Notes: 4 lbs. hinese Qing Dynasty Famille Rose Porcelain Plaque Description: Plaque depicting sparrows on floral branches. Size: 8 x 5 1/2 inches. Weight: 1/2 lbs. Circa: 1900 Material: Porcelain Dimensions: 19 1/4 inches Notes: 1/2 lbs. Chinese Framed Famille Rose Porcelain Plaque Description: Porcelain plaque inscribed with a poem which means: "huge waves from Shanxia almost touch sky, an a unique tower building stands here with its reflection printed on the river". Signature translates: "made in the autumn of Yihai year in the officer house in Zhushan". The plaque mounted in a carved Zitan frame with bats in flight among clouds. The reverse sealed with a lacquer painted panel depicting buildings in a lanscape. Condition: Good Size: Sight: 12 1/4 x 16 1/4; Frame: 18 1/4 x 21 3/4 inches. Weight: 14 lbs. Dimensions: 29 1/2 inches. Condition Report: Good Notes: 14 lbs. Duam France Clear & Frosted Crystal Table Lamp Description: Etch signed Daum France lower right. With new oval shade. Condition: Excellent Size: Crystal base: 5 1/2 inches. Height: Overall: 13 inches. Weight: 6 lbs. Condition Report: Excellent Notes: 6 lbs. Japanese Lacquered Calligraphy Box Description: Rectangular form, array of scenic fans cover the gold textured top with a interior divided tray over a lower deep compartment. English Booths 19th C. Porcelain Tea Pot Description: An early 19th century English porcelain tea pot in the manner of Booths, having a rich cobalt ground and a reserve with hand painted flowers, top having an unopened poppy finial, unmarked. Japanese 19th C. Sumida Gawa Ceramic Vase Description: The ceramic body decorated in relief with children playing. Two character mark to base. Notes: 2 lbs. Japanese 19th C. Sumida Gawa Pouring Vessel Description: A Ceramic vessel with unglazed horizontal ribbing and a heavy blue, red and gray glaze to top rim, large applied long stem lily, double handle with side spout. Shipping weight. 2 lbs. Size: H. 8 1/2 Inches Condition: Chip to underside of spout. Fritting and chip around bodies rim. Chip on the underside of lid. French 19th C. Bronze Trinket Box with Enamel Top Description: A gilded bronze trinket box with hinged lid decorated in blue enamel with incised gild gilded swirls, center reserve with figures in relief. Korean 19th/20th C. Wood Cabinet Description: Comprised of four hinged doors with openwork lattice upper section over a double hinged lower set of doors. One piece construction with paneled sides and canfered back panels. The doors with square locks. Height: 62 1/2 inches. Depth: 17 5/8 inches. Width: 33 3/8 inches. Condition: Some scuffs, a few areas of veneer missing on front foot. Paper liner missing on upper door interior. Victorian Cast Iron Upholstered Bench Description: An elongated oval upholstered bench with wrought iron base. Height: 19 1/4 inches Width: 36 1/2 inches. Depth: 12 inches. Condition: New upholstery. Dimensions: Figurine:13; Overall: 16 1/2 inches. French Bronze Mounted Veneered Vitrine Description: Ormolu mounted vitrine with hinged glass topped surface, velvet surfaced interior. The side glass panels raised on four cabriole legs. Height: 29 1/2 inches. Width: 39 3/4 inches. Depth: 24 inches. Condition: A few areas of glue repairs, minor veneer loss in a few areas. William Columbus Ehrig (American 1892-1973) Oil on Canvas Seascape Description: Artist signed lower right: Wm. C. Ehrig. Size: Canvas: 24 1/2 x 30; Frame: 34 x 38 3/4 inches. Weight: 13 lbs. William Columbus Ehrig was active/lived in Maine. William Ehrig is known for coastal marine, seascape and landscape painting. Dimensions: Height of Stirrup Vessel: 8 5/8 inches. Notes: 13 lbs. German Skull Form Porcelain & Pewter Stein Description: Porcelain skull form stein with pewter mounts. Marked under the pewter rim _0.5L. With porcelain detailed teeth. Condition: Hairline spider crack evident on underside of lid. height 5 1/2 inches. Width: 8 inches. Shipping weight: 2 1/4 lbs. Dimensions: Height of larger: 9 3/8 inches. Patrick Michael Kelly (American 1939-2011) Oil on Canvas Abstract Description: Artist signed in pencil on reverse canvas: Patrick Kelly. Framed, matted and under glass. Size: Canvas: 18 X 24 1/4; Frame: 19 1/4 x 25 5/8 inches Weight: 8 lbs. Patrick Kelly, 1939- listed New York Art Yearbook, 1975-1976, ed. by Judith Tannenbaum, per OMG. Contributed a painting to the third annual, South Coast Community Hospital Building Fund, LAT, May 21, 1971, page H 13; elected judge for Festival of Art, LAT, October 9, 1975, page I 10; ÛÏÛ_paintings by Patrick Kelly, born and educated in London, EnglandÛ? will be shown at 44th Festival of Arts, Laguna Beach, per LAT, July 9, 1979, page OC B 7, and other refs. on historic LAT (ProQuest). Source: Nancy Dustin Moure, "Publications in California Art No. 11 , Index to California Art Exhibited at the Laguna Beach Art Association, 1918-1972; 2015 edition"